Current management of water in the Columbia River basin involves balancing complex, often competing, demands for hydropower, navigation, flood control, irrigation, municipal uses, and maintenance of several populations of threatened and endangered species (e.g., salmon). Current and projected needs for these uses over-commit existing supplies. Water management in the basin operates in a complex institutional setting, involving two sovereign nations (Columbia River Treaty, ratified in 1964), aboriginal populations with defined treaty rights ('Boldt decision' in U.S. vs. Washington in 1974), and numerous federal, state, provincial and local government agencies (Miles et al., 2000; Hamlet, 2003). Pollution (mainly non-point source) is an important issue in many tributaries. The first-in-time first-in-right provisions of western water law in the U.S. portion of the basin complicate management and reduce water available to junior water users (Gray, 1999; Scott et al., 2004). Complexities extend to different jurisdictional responsibilities when flows are high and when they are low, or when protected species are in tributaries, the main stem or ocean (Miles et al., 2000; Mote et al., 2003). With climate change, projected annual Columbia River flow changes relatively little, but seasonal flows shift markedly toward larger winter and spring flows and smaller summer and autumn flows (Hamlet and Lettenmaier, 1999; Mote et al., 1999). These changes in flows will likely coincide with increased water demand, principally from regional growth but also induced by climate change. Loss of water availability in summer would exacerbate conflicts, already apparent in low-flow years, over water (Miles et al. 2000). Climate change is also projected to impact urban water supplies within the basin. For example, a 2°C warming projected for the 2040s would increase demand for water in Portland, Oregon by 5.7 million m3/yr with an additional demand of 20.8 million m3/yr due to population growth, while decreasing supply by 4.9 million m3/yr (Mote et al., 2003). Long-lead climate forecasts are increasingly considered in the management of the river but in a limited way ( Hamlet et al., 2002; Lettenmaier and Hamlet, 2003; Gamble et al., 2004; Payne et al., 2004). Each of 43 sub-basins of the system has its own sub-basin management plan for fish and wildlife, none of which comprehensively addresses reduced summertime flows under climate change (ISRP/ISAB, 2004). The challenges of managing water in the Columbia River basin will likely expand with climate change due to changes in snowpack and seasonal flows (Miles et al., 2000; Parson et al., 2001 b; Cohen et al., 2003). The ability of managers to meet operating goals (reliability) will likely drop substantially under climate change (as projected by the HadCM2 and ECHAM4/OPYC3 AOGCMs under the IPCC IS92a emissions scenario for the 2020s and 2090s) (Hamlet and Lettenmaier, 1999). Reliability losses are projected to reach 25% by the end of the 21st century (Mote et al., 1999) and interact with operational rule requirements. For example, 'fish-first' rules would reduce firm power reliability by 10% under present climate and 17% in years during the warm phase of the Pacific Decadal Oscillation. Adaptive measures have the potential to moderate the impact of the decrease in April snowpack, but lead to 10 to 20% losses of firm hydropower and lower than current summer flows for fish (Payne et al., 2004). Integration of climate change adaptation into regional planning processes is in the early stages of development (Cohen et al., 2006). Figure 14.2. 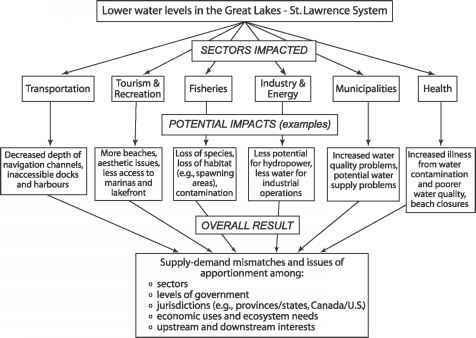 Interconnected impacts of lower water levels in the Great Lakes - St Lawrence system (modified from Lemmen and Warren, 2004). to differences due to climate scenarios, uncertainties include atmosphere-lake interactions (Wetherald and Manabe, 2002; Kutzbach et al., 2005). Adapting infrastructure and dredging to cope with altered water levels would entail a range of costs (Changnon, 1993; Schwartz et al., 2004b). Adaptations sufficient to maintain commercial navigation on the St. Lawrence River could range from minimal adjustments to costly, extensive structural changes (St. Lawrence River-Lake Ontario Plan of Study Team, 1999; D'Arcy et al., 2005). There have been controversies in the Great Lakes region over diversions of water, particularly at Chicago, to address water quality, navigation, water demand and drought mitigation outside the region. Climate change will exacerbate these issues and create new challenges for bi-national co-operation (very high confidence) (Changnon and Glantz, 1996; Koshida et al., 2005). With climate change, availability of groundwater is likely to be influenced by withdrawals (reflecting development, demand and availability of other sources) and recharge (determined by temperature, timing and amount of precipitation, and surface water interactions) (medium confidence) (Rivera et al., 2004). Simulated annual groundwater base flows and aquifer levels respond to temperature, precipitation and pumping - decreasing in scenarios that are drier or have higher pumping and increasing in a wetter scenario. In some cases there are base flow shifts -increasing in winter and decreasing in spring and early summer (Kirshen, 2002; Croley and Luukkonen, 2003; Piggott et al., 2003). For aquifers in alluvial valleys of south-central British Columbia, temperature and precipitation scenarios have less impact on groundwater recharge and levels than do projected changes in river stage7 (Allen et al., 2004a,b). Heavily utilised groundwater-based systems in the southwest U.S. are likely to experience additional stress from climate change that leads to decreased recharge (high confidence). Simulations of the Edwards aquifer in Texas under average recharge project lower or ceased flows from springs, water shortages, and considerable negative environmental impacts (Loaiciga, 2000; Loaiciga et al., 2000). Regional welfare losses associated with projected flow reductions (10 to 24%) range from US$2.2 million to 6.8 million/yr, with decreased net agricultural income as a consequence of water allocation shifting to municipal and industrial uses (Chen et al., 2001). In the Ogallala aquifer region, projected natural groundwater recharge decreases more than 20% in all simulations with warming of 2.5°C or greater (based on outputs from the GISS, UKTR and BMRC AOGCMs, with three atmospheric concentrations of CO2: 365, 560 and 750 ppm) (Rosenberg et al., 1999). 7 River stage: water height relative to a set point. in Midwestern and southern lakes and reservoirs (Hostetler and Small, 1999). Warming is likely to extend and intensify summer thermal stratification, contributing to oxygen depletion. A shorter ice-cover period in shallow northern lakes could reduce winter fish kills caused by low oxygen (Fang and Stefan, 1999; Stefan and Fang, 1999; Lehman, 2002). Higher stream temperatures affect fish access, survival and spawning (e.g., west coast salmon) (Morrison et al., 2002). Climate change is likely to make it more difficult to achieve existing water quality goals (high confidence). For the Midwest, simulated low flows used to develop pollutant discharge limits (Total Maximum Daily Loads) decrease over 60% with a 25% decrease in mean precipitation, reaching up to 100% with the incorporation of irrigation demands (Eheart et al., 1999). Restoration of beneficial uses (e.g., to address habitat loss, eutrophication, beach closures) under the Great Lakes Water Quality agreement will likely be vulnerable to declines in water levels, warmer water temperatures, and more intense precipitation (Mortsch et al., 2003). Based on simulations, phosphorus remediation targets for the Bay of Quinte (Lake Ontario) and surrounding watershed could be compromised as 3 to 4°C warmer water temperatures contribute to 77 to 98% increases in summer phosphorus concentrations in the bay (Nicholls, 1999), and as changes in precipitation, streamflow and erosion lead to increases in average phosphorus concentrations in streams of 25 to 35% (Walker, 2001). Decreases in snow cover and more winter rain on bare soil are likely to lengthen the erosion season and enhance erosion, increasing the potential for water quality impacts in agricultural areas (Atkinson et al., 1999; Walker, 2001; Soil and Water Conservation Society, 2003). Soil management practices (e.g., crop residue, no-till) in the Cornbelt may not provide sufficient erosion protection against future intense precipitation and associated runoff (Hatfield and Pruger, 2004; Nearing et al., 2004). Several simulations (Cox et al., 2000; Berthelot et al., 2002; Fung et al., 2005) indicate that, over the 21st century, warming will lengthen growing seasons, sustaining forest carbon sinks in North America despite some decreased sink strength resulting from greater water limitations in western forests and higher respiration in the tropics (medium confidence). Impacts on ecosystem structure and function may be amplified by changes in extreme meteorological events and increased disturbance frequencies. Ecosystem disturbances, caused either by humans or by natural events, accelerate both loss of native species and invasion of exotics (Sala et al., 2000). At high latitudes, several models simulate increased NPP as a result of expansion of forests into the tundra and longer growing seasons (Berthelot et al., 2002). In the mid-latitudes, simulated changes in NPP are variable, depending on whether there is sufficient enhancement of precipitation to offset increased évapotranspiration in a warmer climate (Bachelet et al., 2001; Berthelot et al., 2002; Gerber et al., 2004; Woodward andLomas, 2004). Bachelet et al. (2001) project the areal extent of drought-limited ecosystems to increase by 11%/°C warming in the continental U.S. By the end of the 21st century, ecosystems in the north-east and south-east U.S. will likely become carbon sources, while the western U.S. remains a carbon sink (Bachelet et al., 2004). Overall forest growth in North America will likely increase modestly (10-20%) as a result of extended growing seasons and elevated CO2 over the next century (Morgan et al., 2001), but with important spatial and temporal variations (medium confidence). Growth of white spruce in Québec will be enhanced by a 1°C temperature increase but depressed with a 4°C increase (Andalo et al., 2005). A 2°C temperature increase in the Olympic Mountains (U.S.) would cause dominant tree species to shift upward in elevation by 300 to 600m, causing temperate species to replace sub-alpine species over 300 to 500 years (Zolbrod and Peterson, 1999). For widespread species such as lodgepole pine, a 3°C temperature increase would increase growth in the northern part of its range, decrease growth in the middle, and decimate southern forests (Rehfeldt et al., 2001). For many amphibians, whose production of eggs and migration to breeding ponds is intimately tied to temperature and moisture, mismatches between breeding phenology and pond drying can lead to reproductive failure (Beebee, 1995). Differential responses among species in arrival or persistence in ponds will likely lead to changes in community composition and nutrient flow in ponds (Wilbur, 1997). Changes in plant species composition in response to climate change can facilitate other disturbances, including fire (Smith et al., 2000) and biological invasion (Zavaleta and Hulvey, 2004). Bioclimate modelling based on output from five GCMs suggests that, over the next century, vertebrate and tree species richness will decrease in most parts of the conterminous U.S., even though long-term trends (over millennia) ultimately favour increased richness in some taxa and locations (Currie, 2001). Based on relationships between habitat area and biodiversity, 15 to 37% of plant and animal species in a global sample are likely to be 'committed to extinction' by 2050, although actual extinctions will be strongly influenced by human forces and could take centuries (Thomas et al., 2004). Added stress from rapid coastal development, including an additional 25 million people in the coastal U.S. over the next 25 years, will reduce the effectiveness of natural protective features, leading to impaired resilience. As property values and investment continue to rise, coastal vulnerability tends to increase on a broad scale (Pielke Jr. and Landsea, 1999; Heinz Center, 2000), with a sensitivity that depends on the commitment to and flexibility of adaptation measures. Disproportionate impacts due to socio-economic status are likely to be exacerbated by rising sea levels and storm severity (Wu et al., 2002; Kleinosky et al., 2006). Sea-level rise has accelerated in eastern North America since the late 19th century (Donnelly et al., 2004) and further acceleration is expected (high confidence). For The IPCC Special Report on Emissions Scenarios (SRES, Nakicenovic and Swart, 2000) scenario A1B, global mean sea level is projected to rise by 0.35 ± 0.12 m from the 1980 to 1999 period to the 2090 to 2099 period (Meehl et al., 2007: Section 10.6.5). Spatial variability of sea-level rise has become better defined since the TAR (Church et al., 2004) and the ensemble mean for A1B shows values close to the global mean along most North American coasts, with slightly higher rates in eastern Canada and western Alaska, and stronger positive anomalies in the Arctic (Meehl et al., 2007: Figure 10.32). Vertical land motion will decrease (uplift) or increase (subsidence) the relative sea-level rise at any site (Douglas and Peltier, 2002). Superimposed on accelerated sea-level rise, the present storm and wave climatology and storm-surge frequency distributions lead to forecasts of more severe coastal flooding and erosion hazards. The water-level probability distribution is shifted upward, giving higher potential flood levels and more frequent flooding at levels rarely experienced today (very high confidence) (Zhang et al., 2000; Forbes et al., 2004). If coastal systems, including sediment supply, remain otherwise unchanged, higher sea levels are likely to be correlated with accelerated coastal erosion (Hansom, 2001; Cowell et al., 2003). Up to 21% of the remaining coastal wetlands in the U.S. mid-Atlantic region are potentially at risk of inundation between 2000 and 2100 (IS92a emissions scenario) (Najjar et al., 2000). Rates of coastal wetland loss, in Chesapeake Bay and elsewhere (Kennish, 2002), will increase with accelerated sea-level rise, in part due to 'coastal squeeze' (high confidence). Salt-marsh biodiversity is likely to be diminished in north-eastern marshes through expansion of cordgrass (Spartina alterniflora) at the expense of high-marsh species (Donnelly and Bertness, 2001). Many salt marshes in less developed areas have some potential to keep pace with sea-level rise (to some limit) through vertical accretion (Morris et al., 2002; Chmura et al., 2003; Chmura and Hung, 2004). Where rapid subsidence increases rates of relative sea-level rise, however, as in the Mississippi Delta, even heavy sediment loads cannot compensate for inundation losses (Rybczyk and Cahoon, 2002). Potentially more intense storms and possible changes in El Niño (Meehl et al., 2007: Sections 10.3.5.4 and 10.3.6.3) are likely to result in more coastal instability (medium confidence) (see Section 14.3.1) (Scavia et al., 2002; Forbes et al., 2004; Emanuel, 2005). Damage costs from coastal storm events (storm surge, waves, wind, ice encroachment) and other factors (such as freeze-thaw) have increased substantially in recent decades (Zhang et al., 2000; Bernatchez and Dubois, 2004) and are expected to continue rising (high confidence). Higher sea levels in combination with storm surges will cause widespread problems for transportation along the Gulf and Atlantic coasts (Titus, 2002). More winters with reduced sea ice in the Gulf of St. Lawrence, resulting in more open water during the winter storm season, will lead to an increase in the average number of storm-wave events per year, further accelerating coastal erosion (medium confidence) (Forbes et al., 2004). Research since the TAR supports the conclusion that moderate climate change will likely increase yields of North American rain-fed agriculture, but with smaller increases and more spatial variability than in earlier estimates (high confidence) (Reilly, 2002). Most studies project likely climate-related yield increases of 5 to 20% over the first decades of the century, with the overall positive effects of climate persisting through much or all of the 21st century. This pattern emerges from recent assessments for corn, rice, sorghum, soybean, wheat, common forages, cotton and some fruits (Adams et al., 2003; Polsky et al., 2003; Rosenberg et al., 2003; Tsvetsinskaya et al., 2003; Antle et al., 2004; Thomson et al., 2005b), including irrigated grains (Thomson et al., 2005b). Increased climate sensitivity is anticipated in the south-eastern U.S. and in the U.S. Cornbelt (Carbone et al., 2003), but not in the Great Plains (Mearns et al., 2003). Crops that are currently near climate thresholds (e.g., wine grapes in California) are likely to suffer decreases in yields, quality, or both, with even modest warming (medium confidence) (Hayhoe et al., 2004; White et al., 2006). Recent integrated assessment model studies explored the interacting impacts of climate and economic factors on agriculture, water resources and biome boundaries in the conterminous U.S. (Edmonds and Rosenberg, 2005; Izaurralde et al., 2005; Rosenberg and Edmonds, 2005; Sands and Edmonds, 2005; Smith et al., 2005; Thomson et al., 2005a,b,c,d), concluding that scenarios with decreased precipitation create important challenges, restricting the availability of water for irrigation and at the same time increasing water demand for irrigated agriculture and urban and ecological uses. The critical importance of specific agro-climatic events (e.g., last frost) introduces uncertainty in future projections (Mearns et al., 2003), as does continued debate about the CO2 sensitivity of crop growth (Long et al., 2005). Climate change is expected to improve the climate for fruit production in the Great Lakes region and eastern Canada but with risks of early season frost and damaging winter thaws (Bélanger et al., 2002; Winkler et al., 2002). For U.S. soybean yield, adjusting the planting date can reduce the negative effects of late season heat stress and can more than compensate for direct effects of climate change (Southworth et al., 2002). Vulnerability of North American agriculture to climatic change is multi-dimensional and is determined by interactions among pre-existing conditions, indirect stresses stemming from climate change (e.g., changes in pest competition, water availability), and the sector's capacity to cope with multiple, interacting factors, including economic competition from other regions as well as advances in crop cultivars and farm management (Parson et al., 2003). Water access is the major factor limiting agriculture in south-east Arizona, but farmers in the region perceive that technologies and adaptations such as crop insurance have recently decreased vulnerability (Vasquez-Leon et al., 2002). Areas with marginal financial and resource endowments (e.g., the U.S. northern plains) are especially vulnerable to climate change (Antle et al., 2004). Unsustainable land-use practices will tend to increase the vulnerability of agriculture in the U.S. Great Plains to climate change (Polsky and Easterling, 2001). 2004). In the absence of dramatic increases in disturbance, effects of climate change on the potential for commercial harvest in one study for the 2040s ranged from mixed for a low emissions scenario (the EPPA LLH emissions scenario) to positive for a high emissions scenario (the EPPA HHL emissions scenario) (Perez-Garcia et al., 2002). Scenarios with increased harvests tend to lead to lower prices and, as a consequence, reduced harvests, especially in Canada (Perez-Garcia et al., 2002; Sohngen and Sedjo, 2005). The tendency for North American producers to suffer losses increases if climate change is accompanied by increased disturbance, with simulated losses averaging US$1 billion to 2 billion/yr over the 21st century (Sohngen and Sedjo, 2005). Increased tropospheric ozone could cause further decreases in tree growth (Karnosky et al., 2005). Risks of losses from Southern pine beetle likely depend on the seasonality of warming, with winter and spring warming leading to the greatest damage (Gan, 2004). 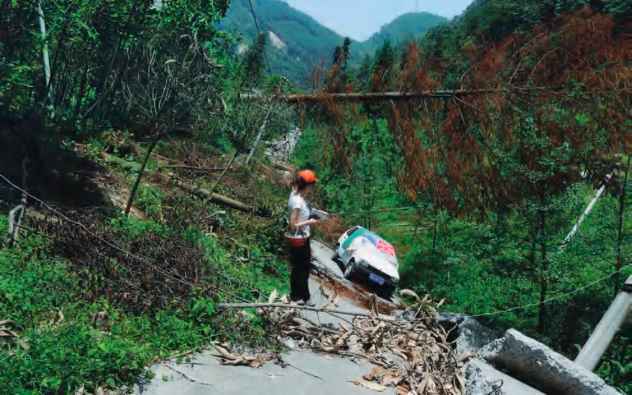 Warmer winters with more sporadic freezing and thawing are likely to increase erosion and landslides on forest roads, and reduce access for winter harvesting (Spittlehouse and Stewart, 2003). 2005), with pressures from climate exacerbated by the expansion of predatory species like smallmouth bass (Jackson and Mandrak, 2002). In Lake Erie, larval recruitment of river-spawning walleye will depend on temperature and flow changes, but lake-spawning stocks will likely decline due to the effects of warming and lower lake levels (Jones et al., 2006). Thermal habitat suitable for yellow perch will expand, while that for lake trout will contract (Jansen and Hesslein, 2004). While temperature increases may favour warm-water fishes like smallmouth bass, changes in water supply and flow regimes seem likely to have negative effects (Peterson and Kwak, 1999). Risks from climate change to human health will be strongly modulated by changes in health care infrastructure, technology, and accessibility as well as ageing of the population, and patterns of immigration and/or emigration (UNPD, 2005). Across North America, the population over the age of 65 will increase slowly to 2010, and then grow dramatically as the Baby Boomers join the ranks of the elderly - the segment of the population most at risk of dying in heatwaves. Severe heatwaves, characterised by stagnant, warm air masses and consecutive nights with high minimum temperatures, will intensify in magnitude and duration over the portions of the U.S. and Canada where they already occur (high confidence) (Cheng et al., 2005). Late in the century, Chicago is projected to experience 25% more frequent heatwaves annually (using the PCM AOGCM with a business-as-usual emissions scenario, for the period 2080 to 2099) (Meehl and Tebaldi, 2004), and the projected number of heatwave days in Los Angeles increases from 12 to 44-95 (based on PCM and HadCM3 for the A1FI and B1 scenarios, for the 2070 to 2099 period) (Hayhoe et al., 2004). Surface ozone concentration may increase with a warmer climate. Ozone damages lung tissue, causing particular problems for people with asthma and other lung diseases. Even modest exposure to ozone may encourage the development of asthma in children (McConnell et al., 2002; Gent et al., 2003). Ozone and non-volatile secondary particulate matter generally increase at higher temperatures, due to increased gas-phase reaction rates (Aw and Kleeman, 2002). Many species of trees emit volatile organic compounds (VOC) such as isoprene, a precursor of ozone (Lerdau and Keller, 1998), at rates that increase rapidly with temperature (Guenther, 2002). For the 2050s, daily average ozone levels are projected to increase by 3.7 ppb across the eastern U.S. (based on the GISS/MM5 AOGCM and the SRES A2 emissions scenario), with the cities most polluted today experiencing the greatest increase in ozone pollution (Hogrefe et al., 2004). One-hour maximum ozone follows a similar pattern, with the number of summer days exceeding the 8-hour regulatory U.S. standard projected to increase by 68% (Bell et al., 2007). Assuming constant population and dose-response characteristics, ozone-related deaths from climate change increase by approximately 4.5% from the 1990s to the 2050s (Knowlton et al., 2004; Bell et al., 2007). The large potential population exposed to outdoor air pollution translates this small relative risk into a substantial attributable health risk. Pollen, another air contaminant, is likely to increase with elevated temperature and atmospheric CO2 concentrations. A doubling of the atmospheric CO2 concentration stimulated ragweed-pollen production by over 50% (Wayne et al., 2002). Ragweed grew faster, flowered earlier and produced significantly greater above-ground biomass and pollen at urban than at rural locations (Ziska et al., 2003). The northern boundary of tick-borne Lyme disease is limited by cold temperature effects on the tick, Ixodes scapularis. The northern range limit for this tick could shift north by 200 km by the 2020s, and 1000 km by the 2080s (based on projections from the CGCM2 and HadCM3 AOGCMs under the SRES A2 emissions scenario) (Ogden et al., 2006). The economies of resource-dependent communities and indigenous communities in North America are particularly sensitive to climate change, with likely winners and losers controlled by impacts on important local resources (see Sections 14.4.1, 14.4.4 and 14.4.7). Residents of northern Canada and Alaska are likely to experience the most disruptive impacts of climate change, including shifts in the range or abundance of wild species crucial to the livelihoods and well-being of indigenous peoples (high confidence) (see Chapter 15 Sections 15.4.2.4 and 15.5) (Houser et al., 2001; NAST, 2001; Parson et al., 2001a; ACIA,2005). Many of the impacts of climate change on infrastructure in North America depend on future changes in variability of precipitation and extreme events, which are likely to increase but with substantial uncertainty (Meehl et al., 2007: Section 10.5.1; Christensen et al., 2007: Section 11.5.3). Infrastructure in Alaska and northern Canada is known to be vulnerable to warming. Among the most sensitive areas are those affected by coastal erosion and thawing of ice-rich permafrost (see Chapter 15 Section 15.7.1) (NAST, 2001; Arctic Research Commission, 2003; ACIA, 2005). Building, designing, and maintaining foundations, pipelines and road and railway embankments will become more expensive due to permafrost thaw (ACIA, 2005). Examples where infrastructure is projected to be at 'moderate to high hazard' in the mid-21st century include Shishmaref, Nome and Barrow in Alaska, Tuktoyaktuk in the Northwest Territories, the Dalton Highway in Alaska, the Dempster Highway in the Yukon, airfields in the Hudson Bay region, and the Alaska Railroad (based on the ECHAM1-A, GFDL89 and UKTR climate models) (Nelson et al., 2002; Instanes et al., 2005).